There is a variety of accommodation available in Sigüenza, from bed and breakfasts to the Castle of Sigüenza itself, which has been transformed into the exclusive Parador Nacional. We sugest some different possibilities for your comfortable stay in Sigüenza. The prices listed below are for single-room accommodation. 'Full-board' accommodation is inclusive of breakfast, lunch, and dinner. Special prices for the Segontiae students. Enquire us. We recommend you to live in a Spanish family, if you want to know in situ the customs and gastronomy of Spanish people. It will be easier for you to practise the Spanish after your lessons. All the families are trustful and the houses are within a short walking distance from the school. The accommodation is full board (breakfast, lunch and dinner). The family living rules will obviously have to be respected. There are rooms available in the same building in which the lessons take place. The rooms are bright and spacious, and each includes an en suite bathroom. They have been adapted to the needs of the disabled. 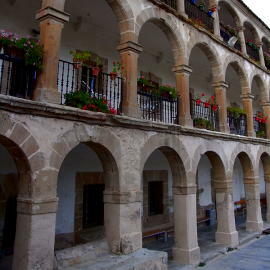 Rural hotels are restored traditional houses with a special charming located in town or in the little villages around. There are many rural hotels in Sigüenza; we have selected a few of them for you, within a few minutes walking distance of the school. Hostals are another common type of accommodation in Spain, normally cheaper than a hotel. Should you require any other type of accommodation, such as rent a flat, do not hesitate to let us know.